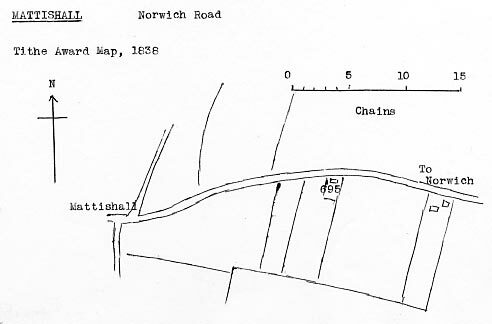 Mattishall smockmill was built to the east of the village just to the south of the Norwich Road. The mill ran two pairs of French burr stones, a flour mill and jumper. Isaac Hardy married in 1766 and his son Michael snr. married Mary (née Kiddle) with their son Michael jnr. being baptised in 1794. Michael jnr. 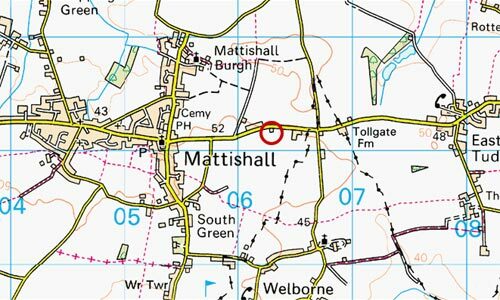 married Elizabeth (née Meachen) and they had 3 daughters at Mattishall. Ann was baptised on 6th May 1819, Harriet on 23rd February 1823 and Elizabeth on 22nd March 1826. Michael Hardy jnr.had been involved with milling for some years by the time he built Dereham_towermill in 1836. In 1819 he owned and ran Mattishall Norwich Rd smockmill and in 1829 he started to run the newly built Gressenhall smockmill and in 1836 he was also running Ovington old postmill. In 1851 Michael Hardy jnr was a baker living at Frinket Street and his son Michael jnr. jnr. was baptised at Beetley in 1831. MICHAEL HARDY, formerly of Mattishall, Miller, and at the same time carrying on business as a Baker at East Tuddenham; then of Wicklewood, Miller; then of Beetley, Miller and Baker; then of Wicklewood aforesaid, Miller; and lately of Wicklewood, aforesaid. The earlier announcement in the London Gazette on 12th October 1838 described Michael Hardy as a Journeyman Miller. An excellent SMOCK TOWER WINDMILL now in full trade with two pair of French Stones, Flour Mill and Jumper with all Going Gear complete, in good repair, with or without six acres of Arable Land. Apply to Mr. William Butter at Mattishall. To be Sold by Auction by Mr. Samuel Lock at the Swan Inn, Mattishall on Thursday 4 July at 4 o'c. A capital Freehold WINDMILL with Dwelling house attached situate in Mattishall in Norfolk now in the occupation of Mr. William Butters. Also two pieces of land at Welborne. Possession will be given at Michaelmas next. Apply to Mr. I. O. Taylor, Solr. St. Giles, Norwich. Lot 1. A capital WINDMILL with a Messuage, Barn, Outbuildings, Yard, Garden and appurtenances thereto belonging, situate at Mattishall and now in the occupation of Mr. William Butter. Particulars of Mr. I. O. Taylor, Solr. Norwich, the Auctioneer at Barton Bendish and at the place of sale. A Capital POST WINDMILL eligibly situated in the populous Town of Mattishall near East Dereham in the County of Norfolk, now occupied by Mr. Butter. For rent etc. apply to Mr. I. O. Taylor, Solr. St. Giles Street, Norwich.